It's the new year and I don't have much in the way of randomness this week. But I do have some cute pictures from last year. Which would be like one week ago, give or take. 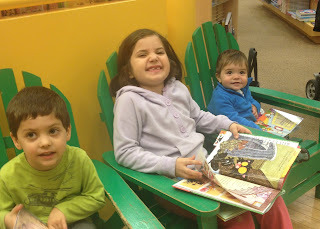 Mark and I took the kids to Barnes and Noble, one of my favorite things to do. Mark hardly ever is able to join us, but we had all three of them for a Saturday morning right before Christmas. Bagels, muffins, chocolate milk...and books! Also, we made Christmas ornaments. Seriously awesome tutorial from here. I highly recommend it--pin it and put it on your to-do list for Christmas 2013. Mark took this picture of the mountains. We are surrounded by beautiful snow-capped peaks this time of year. Usually the air quality is too poor to even know they are there, especially in summer. So when they make an appearance, it is nice to remember how truly beautiful they are. Have you ever read anything by Gretchen Rubin? She is a blogger who started something called the Happiness Project, which morphed into a couple of book deals and a monthly column in Good Housekeeping magazine. I really enjoy her. I plan on reading both of her books this year. Maybe while I'm drinking a glass of this chardonnay gifted by a neighbor. My best cousin, Cathy, and her husband, Terry (a fellow Minnesotan--both of us California girls married awesome Minnesota guys...), have two really amazing sons, Tim and Travis. Tim and Rachel have been married a couple of years. Rachel has a cool cooking show. Travis and Shannon just got married. Shannon is an amazing professional photographer (oh, wow, the annual family pictures that we always take around Mother's Day, usually by hitting the timer on our camera and involving Aaron running to take his place in the picture) will be amazing this year. Because Shannon is going to take them. But I digress. Shannon and Travis are taking a picture a day. In their wedding clothes! Each day! Super cool. I can't "borrow" any pictures but check out their website. The pictures each day are really fun and creative. What about you? Anything random already happening in this new year? Wow...I just looked at the date on your post..1313!!! Love the look on the faces of the little ones at the bookstore. Very cute. The snowcapped mountain range looks so pretty. A picture each day in their wedding clothing sounds like a blast. I'll have to check it out. 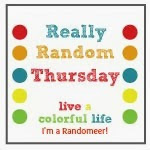 Welcome to your first RRThursday post! And I love that it's 1313, like Needled Mom pointed out. I checked out their blog of the couple of their wedding clothes and I just have to say that they are really getting the mileage out of those--fun idea, but then we'd have to FIT into our wedding clothes at this point, which would be a non-starter around here. Fun to see pix of the grandkids, always, and fun to see you enjoying them. Oh those kids are just so adorable! OPQuilt made me giggle - there's clearly NO WAY I'd get even an arm into my wedding dress at the moment! Apart from the incident with the polar bears, I have been random-free this year! Fab! I even loved the date (cos we write it like this:3/1/13!) 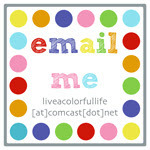 Must check out Gretchen's blog! We all need some more happiness in our lives! I have read the happiness project - good food for thought. CUTE pics with the grandkids - you already know I got to babysit mind this week! ;-) Mostly I'm sharing random sewing stuff AGAIN....posting late but it's still Thursday where I live! I will try to get back to blogging soon. I get so behind it's hard to know where to start. Target is a great source of inspiration, huh? I always love your random posts.